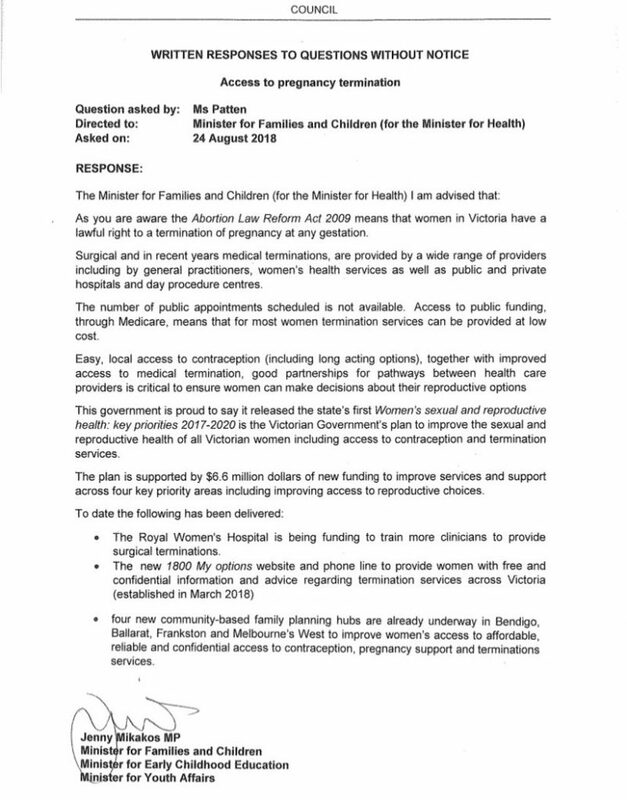 MS PATTEN (Northern Metropolitan) (12:06:10) — My question is for the Minister for Families and Children, representing the Minister for Health. Women in Victoria have a lawful right to access a termination up until 24 weeks. However, I am increasingly contacted by women who have been unable to access terminations in public hospitals. These terminations are available in the private sector to those who can afford to pay for them but this seems to be decreasingly true in the public system, so I ask the minister to detail the specific number of public system appointments currently available for terminations between 14 and 18 weeks and 18 and 20 weeks. MS MIKAKOS (Minister for Families and Children) (12:06:49) — I thank the member for her question and her interest in women’s public health. She has asked for some very specific details around numbers of appointments. That is information that I do not have at hand, but I will endeavour to seek a written response for the member with the details that she is seeking, if they are in fact available. 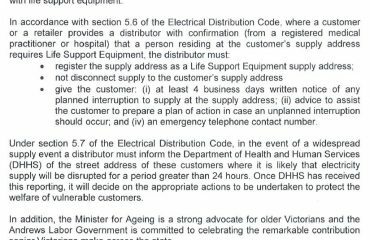 MS PATTEN (Northern Metropolitan) (12:07:21) — Thank you, Minister. By supplementary, I ask the minister what actions she is taking to ensure that women who cannot afford private sector services can access terminations between 20 and 24 weeks. MS MIKAKOS (Minister for Families and Children) (12:07:39) — Again I thank the member for her question and her interest in these matters. I will endeavour to seek a written response to her supplementary question as well.